So this is a thing that's happening. 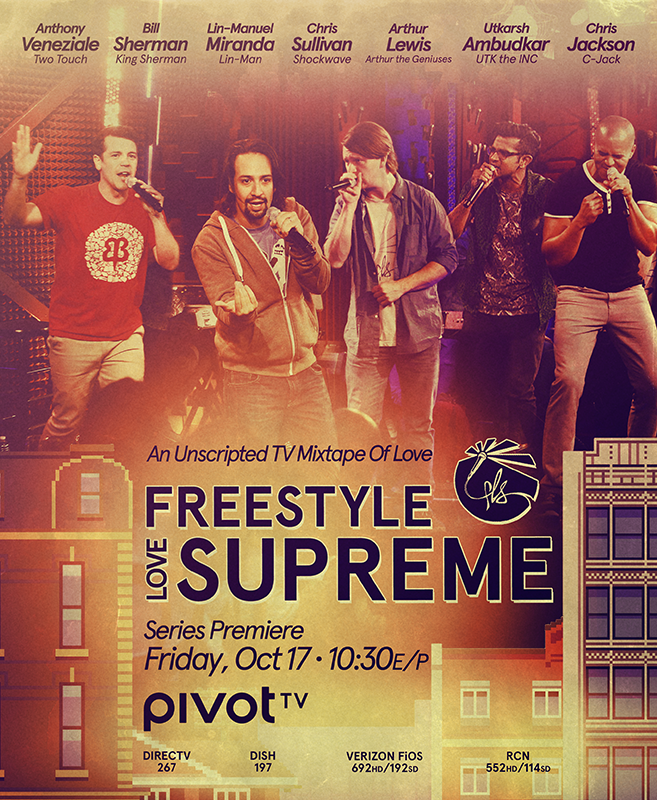 Freestyle Love Supreme, the freestyle rap improv comedy group I've been playing keys and singing in since 2003, has gone and gotten ourselves a TV show. And not just some well-produced video on the Internet. A real live 10 episode season on Pivot, the cable network behind Joseph Gordon-Levitt's Hit Record. We're on tonight, Friday Oct. 17th, at 10:30 Eastern, and 7:30 Pacific. And then every Friday after that for 9 weeks. For those of you who don't get Pivot (DirectTV: 267, Dish: 197, Verizon FiOS: 692HD / 192SD, RCN: 552HD/114SD), you can also watch on Amazon or iTunes.